I have just realised via my friend who after 13 years away from real and changing life as we know it.......I have just realised that I have come to accept so much of the unacceptable. The copious pressure of life. Ordinary life. Life that shouldn't be a part of the 21st century. Backward, broken life. Why have we become so accepting of things that don't work properly? Things or situations that are genuinely uncomfortable? Nothing works in London. Everything is a chore. We have embraced hardship. We have embraced difficulty and awkwardness and have learned to live with it. We have learned to be governed by machines. Phones - texts - e mails - never out of touch. Always contactable but never entirely neccessary. Perhaps these are the assorted ramblings of a mad woman but I am currently feeling awfully out of sorts with everyday London life. I dare say life in the 'cuntry' is any different....Where to go? Where indeed? When on earth was there ever a traffic jam at 11.30pm at night and why? For god's sake. What am I doing in Victoria? I am on the Hades bus - the trip to nowhere very slowly indeed. 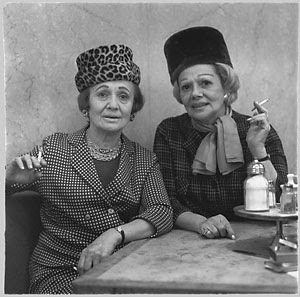 Two lumpy spinster sisters with matching soft rosy cheeks have just sat down one beside and one opposite. They are eyeing my scribble with disdain. I have two bags - one crammed full of work papers and personal post that I haven't had a chance to open over the last few weeks. Try explaining that to the boring bank people that waste world time by calling you up to remind you that you have missed a payment.The other bag is bright mustard yellow and has a pair of high heeled boots in it. No one understands. Doubtless I will be able to decipher this myself in the morning as I am scribbling from the back of the bumpiest bus in the world. The two spinster sisters are trying to read what I am writing but it is so quickly and bumpily written it is almost in code. Only my champagne-scrambled brain will be able to work it all out in the morning. Bloody hell. Sloane Square - is that all? Slow slow slow. Feet up on opposite seat now - Route79 wouldn't approve but it is the only way I can steady myself. The sisters got off at Beaufort Street. They probably share a mansion flat. No more peeking. No more speculating. Just back to their lonely cells. They both looked so out of time and place. A throwback to goodness knows when. 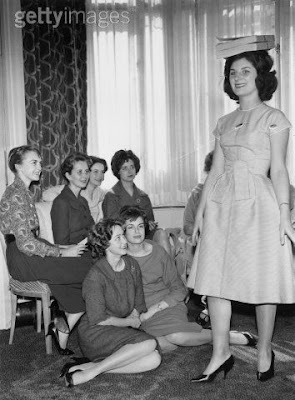 Disappointed not-very-pretty debutantes that no one wanted to marry. Perhaps I got too used to black cabs from an early age? I could always justify the cost of a black cab. 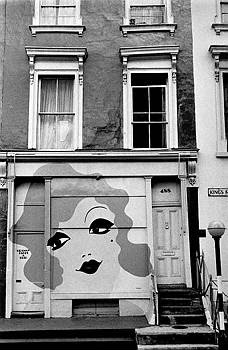 I used to be a nightbus afficionado but graduated to black cabs with ease by the time I was 21. Now I am the scribbly lady - scrabbling scribbling into her notebook on the bus. 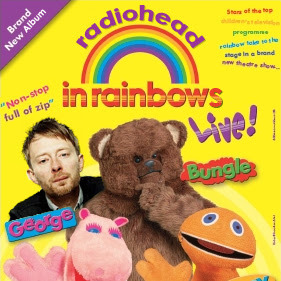 Well if you will put out your long-awaited album for free on the tinternet - what do you expect? This story is a week old but is still extremely present and is one of the reasons why I haven't been blogging lately. 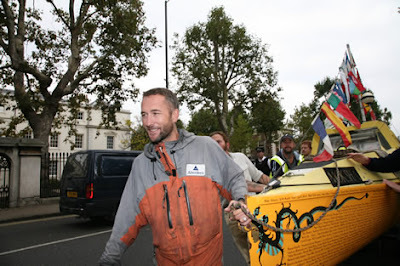 Big up to Jason Lewis who as of last Saturday 06 October 2007 completed the first ever circumnavigation of the globe via human power. No wind, no sails just hiking, kayaking, rollerblading, cycling and pedalling his custom-built pedal boat Moksha on the Atlantic, Pacific, Indian ocean and Channel legs. You can read the fascinating journal here or go to the main site here. I became involved (by utter random fluke!) around 6 years ago mainly as part of the media support team. I was catering manager and boat-pusher on Saturday. Developing ideas for tv and producing is fine. Boat-pushing is fine. Sorting out a completion party for 120 people made me bite all my nails off. How am I going to cram everything in my car without destroying the clutch? How am I going to get everything there in time? Why haven't the fluorescent vests been delivered from the man on ebay yet? Will anyone like the food? Will there be enough food? Will we actually get everyone in to the venue? Are the chairs comfortable enough for the old people? Will anyone actually eat? Will the tealights be a fire hazard? The answer to the last question was yes - they set fire to flowers on the table near visiting babies heads if you are not careful. The expedition was a truly incredible feat. A proper adventure fraught with the inevitable near-death experiences due to illness, an insistent crocodile, far too many snakes, military coups, the ocean in general and severe injury not to mention the incessant lack of funds to keep going from day to day and dodgy government officialdom doing their best to thwart progress. 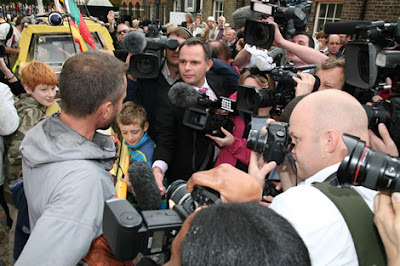 13 years and 46505 miles later Jason arrived to clamouring hordes of broadcast and press journalists. Most of us donned our fluorescent vests earlier that morning in a valiant attempt to keep the ensuing media scrum under control. The most heartening thing about the last minute or two of the final finish which involved us pulling Moksha from a slipway in Greenwich, through the streets and up the hill to the Greenwich Meridian was the public crowd lining the final route all cheering and clapping so happily. It was truly overwhelming. I turned to Sher (who accompanied Jason on the Mumbai to Djibouti leg) behind me and tried to speak but realised I was gulping like a goldfish with what felt like a big hard stone lodged in my chest. A big chunk of emotion disabling me from doing anything apart from continuing to push the boat and grin inanely with tears pouring silently down my face. I couldn't see the front but I know Jason was completely overcome. Not surprising really. The party went by without a hitch and was enhanced greatly by the 12 magnums and huge Jeroboam of fabulous champagne as well as a further 48 bottles of award-winning red and white so generously donated by Lynn Murray of Taittinger for the day. A good time was had by all. The best thing about the final day was the feeling of family within the previously scattered team - members from America, UK, Belgium, India, Singapore et al all came together at Greenwich and worked together to ensure the day went smoothly. I met people I have never met before but feel I have known all my life due to the common ground we share with the expedition. A great and true human first. Expedition 360 does not end here. We aim to continue the ethos and original premise of the expedition in other media and educational forms for the future. I am proud and honoured to be a part of it. John Macartney for Radio 4's Excess Baggage programme interviews Jason Lewis here. I loathe pretty much anything with pineapple in it but can in fact tolerate fresh pineapple. Do I get first prize for this week's most inane and dull opener across the blogosphere? Oh I do hope so. Anyway, bear with me - all will become clear shortly. Someone offered me some dried fruit in a meeting last week. Oh the choice, shall I have the orange or the green or the yellow shoe leather? I foolishly plumped for a clump of small yellow triangly bits. Acccchhhhh! Spit. Growl. Choke. Wince dramatically. Meeting abruptly halts for at least four amazed seconds. Dried pineapple is satanfood it really is. Mango fine. Pineapple no. Then. Then. The next day by weird coincidence I woke up with Rupert Holmes's classic No 1 hit Escape (The Pina Colada Song) whirling around gaily in my head. Did my brain make a random connection I wonder? Is it some weird form of OCD? Could I get the song out of my head? No. Did I listen to it about five times in a row really loud when I got to work? Yes. Oh how we laughed. Then I had to wiki Rupert Holmes. And then I just had to stop. Enough pineapple related torture already. 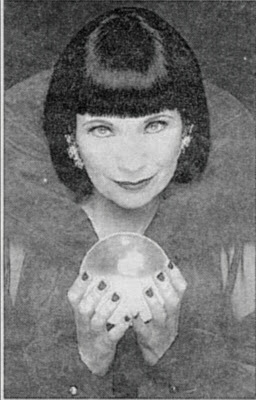 For some reason I was going to write something about Mystic Meg but have completely forgotten what it was now. So for now you will just have to listen to and watch the Pina Colada Song.